These electric bikes fold up in mere seconds and are extremely portable making them ideal for commuters. Founded in Estonia, Stigo is making its debut in the Japanese market. This innovative company has created collapsible and portable electric bikes that make commuting easier than ever. Global Startup Center concierge, Yoshi, kindly represented Stigo and shared how this amazing startup is taking root in Fukuoka. Don’t forget to stop by Startup Café to see a model of the Stigo bike. If you’d like to order your own bike direct from Fukuoka, you can go here to order from the Stigo Japan site. What is a Stigo bike? 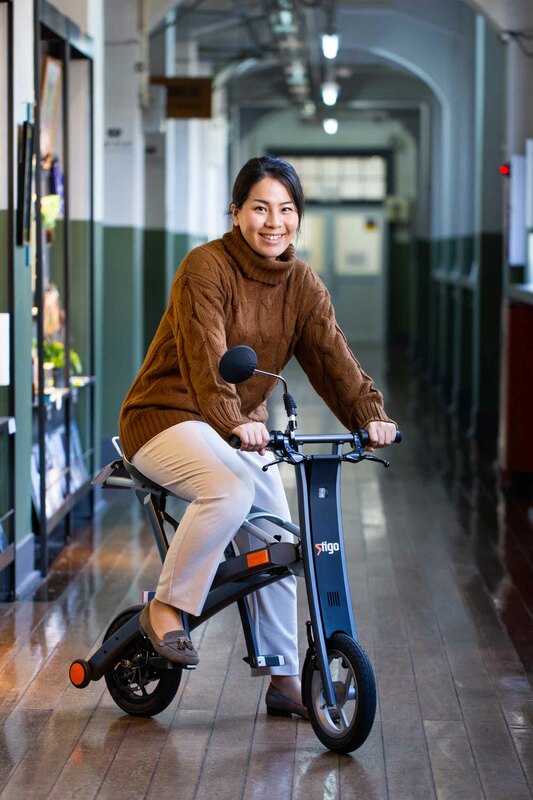 Stigo creates bikes that run on electricity are foldable and are also portable. It’s an innovative and practical approach to commuting. Plus, if you have a moped license, you can drive a Stigo on the public roads in Japan. What makes Stigo bikes so unique? It only takes 2 seconds to fold – I’ve never seen a bike you could fold so quickly! When folded, it takes on a suitcase-like shape, which makes it very easy to carry. It’s also quite small and compact, which is important for Japanese riders. Normally, we would have to rent a parking space for a bike or a moped. With my Stigo, I fold it up and keep it in my entryway. It saves me money, and it’s always right there when I need it. How will these bikes improve commutes? Stigo is a game changer. It’s a totally portable e-bike – that’s incredibly unique. I know when I moved from Fukuoka to Kyoto as a university student my father had to load my moped on a truck to get it to school. If I’d had Stigo, it would have been much easier to fold and pack up. You can take Stigo anywhere like the train, Shinkansen, and car. The one place you can't take it is the airplane since Lithium-ion batteries aren't allowed through security. Still, Stigo gives you the freedom to go where you want when you want. If you live in a rural area, it's no problem. Just ride your Stigo to the station, fold it up, and hop on the train! Once you get to your stop, unfold the Stigo and keep riding. Why did the Stigo team decide to launch in Fukuoka? After Fukuoka city and Estonia signed an MoU for startup collaboration, the two communities began to work closely together. In February 2018, Fukuoka city's delegation visited Estonia and was introduced to Stigo. This was very fortunate timing, as Stigo was already researching how to enter the Japanese market. Since our relationship with Estonia is so strong, we wanted to do everything possible to support Stigo and help them to market their product in Japan. It really is a perfect match, as Stigo’s bikes are well suited for Fukuoka. Our city is one of the best in Japan for bike-commuting, as it’s a very livable and compact city. Stigo will be a very welcome addition to our transportation options in the city. How is the GSC helping Stigo to enter the Japanese market? There were many important things we needed to help Stigo with before they could sell in Japan. We helped them to clarify the local laws and regulations to ensure they were compliant with Japanese rules. We also provided creative support to assist Stigo in developing a Japanese version of their product with tiny changes from the original design. By resetting the maximum speed and adding another mirror, Stigo is ready for public roads in Japan! What’s next for Stigo in Fukuoka? We are planning to rent Stigos to visitors to Shikanoshima island in Fukuoka-city. 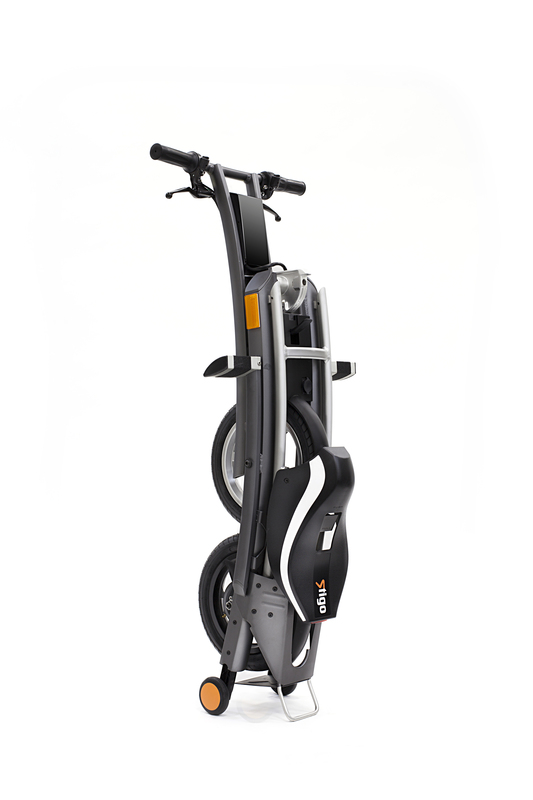 We want the public to get the chance to try Stigo bikes in the real world. Once they try them, we're certain they'll want their own.